Contemporary of St. Abban of Magheranoidhe. Benedictine monk, who died in 1004. Bishop of Hexham, companion of St. Wilfrid. Acca died in about 742. Grandson of Charles Martel. Adalard was abbot of Corbie, and Pepin's prime minister. He died in 827. Apostle of Prussia. Bishop of Prague, forced to flee his see. Missionary to the Hungarians and Poles. He was murdered in 997. Apostle of the Slavs. Monk, missionary to Russia, abbot, and bishop of Magdeburg, d. 981. 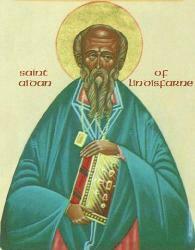 Irish-born abbot of Iona, and St. Columba's biographer. Or Adelheid. The widow of Otho, she died in 999. 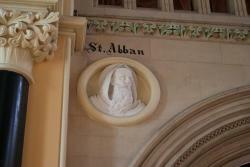 Abbess, renowned for having the gift of miracles, d. 1015. Benedictine monk, pilgrim, scholar, pastor, Archbishop of Vienne, d. 875. Cistercian abbot, homilist, spiritual writer, d. 1166 or 1167. Irish hermit, hagiographer, poet, late eighth century. Martyred at Augsburg in the Diocletian persecution (c. 304) for refusing to participate in pagan rites. 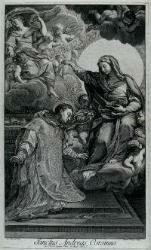 Abbot of Stavelot, bishop of Cologne, martyred in 750. 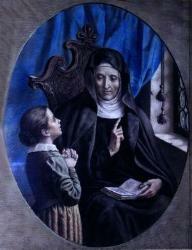 Younger sister of St. Clare, and prioress of the Poor Clares at Monticelli. 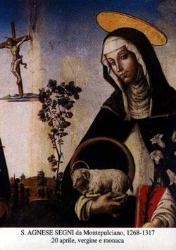 Called Agnes of Prague in some lists, a princess, abbess, and thaumaturgist or miracle worker. 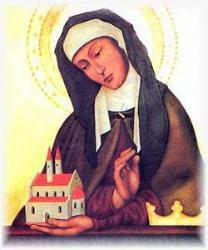 She was born in 1200 in Prague, the daughter of King Ottocar and Queen Constance of Hungary, a relative of St. Elizabeth. 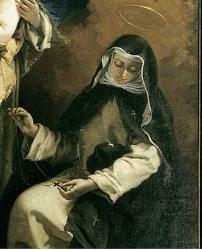 Entered the convent at the age of 9, commissioned by the pope to found a monastery at the age of 13 (and 2 years later she was made its superior), also founded a Dominican convent, d. 1317. 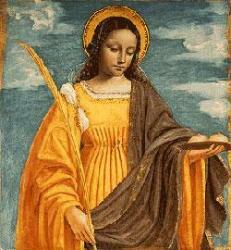 Virgin, martyred at the age of 12 or 13, revered since at least the mid-fourth century. 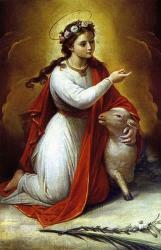 A popular saint about whom little is known, Agnes is said to have been a beautiful, wealthy Roman maiden who had, in childhood, dedicated herself to God. Irish monk, first bishop of Lindisfarne, d. 651. 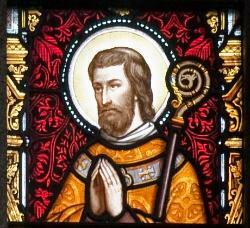 A disciple of St. Patrick and bishop of Emly, died in the first half of the sixth century. Irishman, rector of the School of Clonard, distinguished scholar and author, d. 664. First martyr of Britain, d. about 304. Missionary and martyr. 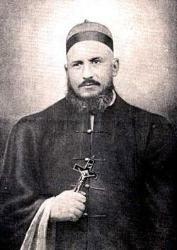 Born near Naples, Italy, Alberic joined the Milan Foreign Missionary Society and was sent to Chinain 1888. Cardinal, bishop of Liege, martyred in 1192 or 1193. Also known as Known as Albert the Great. Called 'the Universal Doctor.' Dominican scientist, philosopher, theologian, instructor of St. Thomas Aquinas. Bishop of Hexham, died 781. Daughter of SS. Walbert and Bertilia. 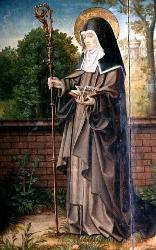 Flemish nun, founder of monastery at Maubeuge, d. about 684. Abbot of Malmesbury, bishop of Sherborne, poet, d. about 709. Bishop of Le Mans, d. 856. Patriarch of Alexandria. 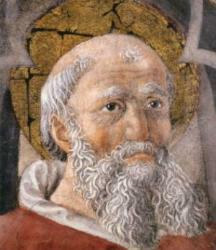 Elected instead of the heresiarch Arius, who had been scheming to be made bishop. A man of great holiness, St. Alexander died in 326. Called 'The Charcoal Burner.' Made bishop of Comana at the recommendation of St. Gregory Thaumaturgus. 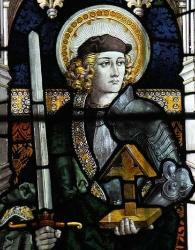 St. Alexander was martyred in the Decian persecution. Alexander, Bishop of Cappadocia, imprisoned for his faith, served as coadjutor to the Bishop of Jerusalem. Exiled and again imprisoned, Alexander was tortured and died in prison in 251. Visionary, co-founder of the Servites, uncle of St. Juliana Falconieri. 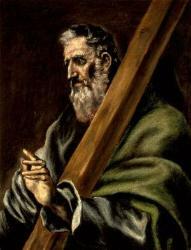 St. Alexis died in 1310, at the age of 110 years. 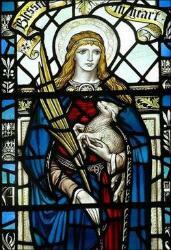 Daughter of King Offa of Mercia. Hermit at Crowland, fl. 795. Monk of Winchester, became the last bishop of Sherborne, d. 1058. English hermit and martyr, d. about 700. 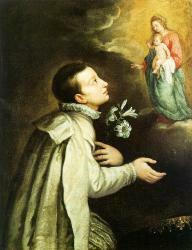 Jesuit student, who died in 1591 at the age of 23. Spanish-born widower, Jesuit lay brother, served as porter at Majorca for 46 years, d. 1617. Also known as Alonso. 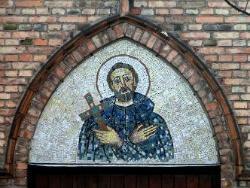 Irish-born hermit and missionary in Bavaria, monastic founder, eighth century. 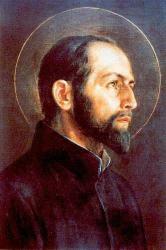 Close friend of St. Augustine of Hippo. 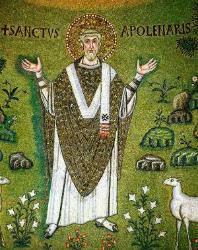 Like Augustine, Alypius was baptized by Ambrose. St. Alypius became bishop of Tagaste. Sister or niece of Pepin of Landen. Amalberga was married to Witger; they both entered monastic life. Also called St. Amelia. Virgin who rejected Charlemagne's advances. Hermit, missionary, bishop of Maastricht, monastic founder, d. about 690. Bishop of Milan, and Doctor of the Church, who died in 397. 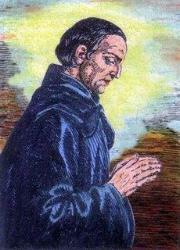 Born Ambrose Traversari, theologian, translator of many of the Fathers, author, d. 1439. One of the desert fathers. Lived with his wife for 18 years as brother and sister, after which he became a hermit in Nitria and she also became a monk. Fourth-century Egypt. Martyr, whose feast day is 25 December. Attracted a cultus at Rome in the late fifth century, and a sixth-century legend makes her a Roman matron, though martyred elsewhere. A former magician and soldier, converted to Christianity, became a monk. 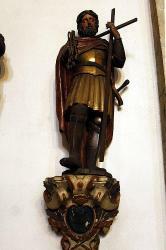 He was martyred in 628. Bishop of Antioch, exiled by the emperor, restored to his see in 593 by St. Gregory the Great. Anastasius died in 598. Seventh-century abbot of the monastery of Mt. Sinai, vociferous opponent of the Monophysites and Monothelites, writer. 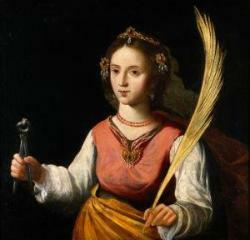 Virgin and martyr, was denounced as a Christian and put to death by the sword in the Decian persecution. Third-century bishop of Laodicea, mathematician, scientist, philosopher. Patriarch of Constantinople, anti-Nestorian, anti-Eutychian. Some say he was killed by heretics in 458. Was stoned to death at Lampsacus, during the Decian persecution, along with his companion Paul. The Apostle in Scripture and tradition. Canon lawyer, priest, reformer, Theatine, d. 1608. Polish Jesuit priest and missionary, martyred in 1657. Article on this Carmelite, called 'the Apostle of Florence,' regarded as a prophet and thaumaturgus, who became bishop of Fiesole, and died in 1373. Brother of St. Bridget the Younger and archdeacon of Fiesole, d. about 877. 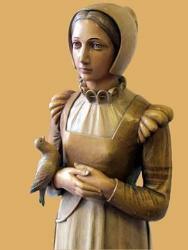 Founder of the Ursulines, who died in 1540. 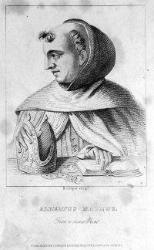 Abbot of Centula, fathered two children by Charlemagne's unmarried daughter Bertha. He died in 814. According to apocryphal literature, the mother of Mary. A convert to Catholicism, hanged in 1601 for the (unproven) crime of harboring a priest. She is one of the Forty Martyrs of England and Wales. A little village three miles from the town of Auray, in the Diocese of Vannes, famous for its sanctuary and for its pilgrimages, or pardons, in honour of St. Anne. 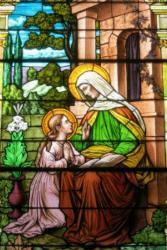 Devotion to Saint Anne, in Canada. Former soldier, Archbishop of Cologne, d. 1075. Benedictine monk, missionary to Scandinavia, bishop of Hamburg, d. 865. Benedictine monk, abbot, reformer, d. 833 or 834. Duke of Forum Julii, Benedictine monk, monastic founder, Abbot of Nonantula, d. 805. Appointed bishop of Lucca by his uncle Anselm of Lucca the Elder (Pope Alexander II), then became a Benedictine monk, served as papal legate, and died in 1086. A Doctor of Medicine, founder of the Barnabites, d. 1539. Martyred in about 306 at the age of 18. Born in Vienne, became bishop of Valence, was exiled to Sardinia, d. 520. Second-century bishop of Hierapolis, apologist. 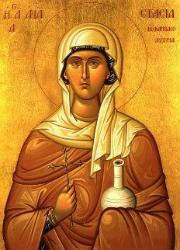 A virgin, possibly ordained, martyr at Alexandria in late 248 or early 249. 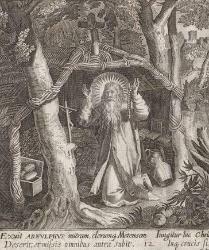 Irish, traveled to the Continent and became a hermit, bishop of Strasburg, famous for miracles. He died in 678. A canon of Milan, reformer, martyr, murdered by agents of the bishop of Milan in 1065. Frankish civil servant at the court of Austrasia, bishop of Metz, hermit, d. about 640. A Roman, was tutor to the emperor's children before fleeing to the monastery of St. John the Dwarf. Arsenius died in 450. First bishop of the Welsh town named after him. Second half of sixth century. St. Patrick's coppersmith, also a renowned bellfounder, Bishop of Elphin. Burgundian monk, companion of St. Columban in exile, co-founder and abbot of Bobbio, d. 627. 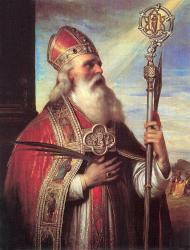 Contemporary of St. Patrick, founder of a hospice and several churches. Apostle of Auverne, said to have been the first bishop of Clermont. Probably early fourth century. 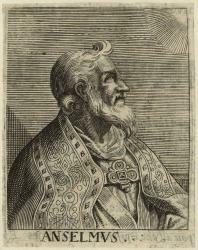 Anti-Arian Bishop of Vienne, converted King Sigismund, was a renowned poet, d. about 518.